Warren Johnston finds well-made, available wines in the $10 range. Award-winning French winemaker Jean-Claude Mas has a good sense of humor, and he has used it to create the line of witty and delightful Arrogant Frog wines. The frog posed on the labels — nattily dressed in a beret, ascot and waistcoat holding a cane in one hand and lifting a glass of wine with the other — not only pokes fun at the pejorative used to describe the French, but perhaps also has a go at wine snobs who think the only good French wines come from Bordeaux and Burgundy. With the label, Mas is saying he will give the most prestigious French wines a run for their money with his bright, complex affordable wines from the lowly region of Languedoc. I think he’s pulling it off, at least in this price range, and he’s reaching younger drinkers, the fastest growing demographic. Mas is described as pioneer of the “new Languedoc,” a bright light in French winemaking. He describes his wines as “rural luxury.” It’s his philosophy of creating accessible wines “to be shared at special moments that are rich in emotion; that is the real luxury today,” he said in a 2016 interview published on the Visit French Wine website. Languedoc, located in south-central France on the Mediterranean Sea, is the largest and arguably the country’s most important wine district, producing more than one-third of France’s wine grapes, according to Jancis Robinson in The Oxford Companion to Wine. Now, while the region’s premium wines represent only about 10 percent of France’s better wines, that’s rapidly changing, and more and more quality wines are coming from Languedoc as such younger skilled winemakers as Mas take over. Mas was born in Languedoc and grew up in the family’s vineyards in the town of Pezenas. He is the family’s fourth generation of winegrowers. On the company’s website and in articles, he tells the story that during a harvest when he was 3, he escaped from his mother and ran more than a mile and a half to meet his grandfather in the wine cellar. He says that was the moment when his passion for wine was born. Although he maintained the interest, wine became a hobby for him for a while. He got a college degree in economics and advertising, worked in the north of France, England and Miami, but kept dabbling in wine sales and promotion. He also devoted the first three years of his professional life to his other passion: car racing. In the early 1990s, he returned to wine and France. For four years, he worked with Bordeaux winemakers and the famous Italian winemaker Giogio Crai. He learned the art of blending and to create wines with style. He bottled his family’s first blended wine in 1995. Jean-Claude Mas took over the reins of the family’s 80-acre Chateau Paul Mas vineyard in 1999 and created Domaines Paul Mas a year later. Today, the company owns 1,500 acres of vineyards and partners in another 3,500 acres. It produces 22 million bottles a year with more than 80 percent classified as being from a protected geographic region, the Pays d’Oc. 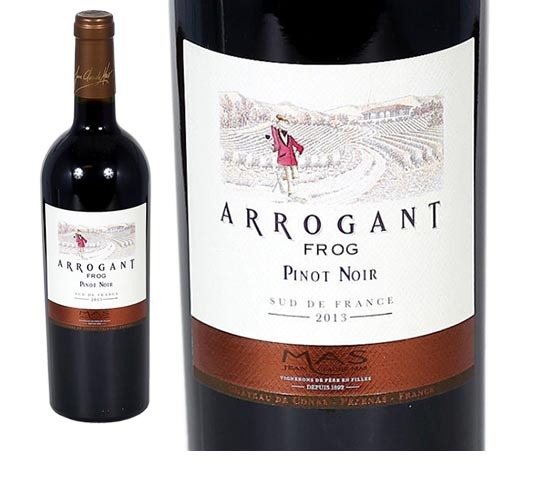 Arrogant Frog Pinot Noir, Sauvignon Blanc and Rosé are bright, complex and affordable wines that are available in New England. They are all excellent for drinking through the warmer months into the fall. I chose to focus on the Pinot Noir, because it’s the most widely available in the Twin States. The other two wines are expanding on the market in Vermont and are coming to New Hampshire stores in the near future. The wine is made from 100 percent Pinot Noir grapes picked from vines that are at least 23 years old and planted in clay and gravel limestone soils. Half the wine is aged in new oak barrels, and half in stainless steel tanks before they are blended. It ages another two months before bottling. The result is a bright medium-ruby colored wine with aromas of fresh strawberries, cherries and sweet spices with a hint of vanilla. The medium-bodied wine has ripe, silky tannins, firm acidity and a long finish, the tasting notes say. It was a fine match with the grilled, maple glazed salmon I prepared recently, and Mas suggests that it also goes well with white meat entrees and assorted cheeses. Serve it slightly chilled, and it’s great on a warm night for just sipping. All three Arrogant Frog wines taste like they should cost much more than the $9.99 asking price. I’ve also seen them on sale for as much as $2 less. That’s when it’s time to buy a case. Suggestions of wines in the $10 range are always appreciated. Warren Johnston can be reached at raiseyourglassofwine@gmail.com. Warren Johnston’s column, which appears in newspapers and on-line, is designed to help readers cut through the sea of wine offerings that crowd the shelves of stores and find well-made, available wines that sell in $10 range.